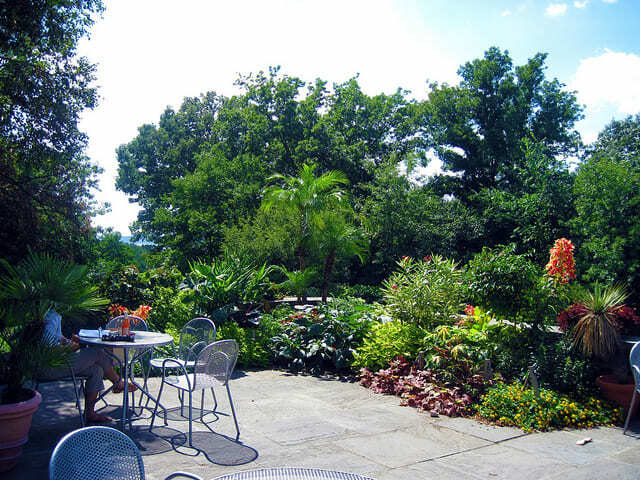 Located in historic Wave Hill House, The Café at Wave Hill offers guests delicious and artisanal food selections to enjoy as they take in captivating views of the Hudson River and Palisades. Operated by Great Performances, The Café serves a menu of local ingredients from the Northeast, including its very own 60-acre Katchkie Farm in Kinderhook, NY. Each seasonal menu features warm entrées, sandwiches, salads, snacks, coffees, teas, refreshers, beer and wine. Menu offerings always include vegetarian, vegan, gluten-free and kid-friendly options. Kosher beverages and snacks are available year-round; sandwiches and salads, under Star-K certification, are included in the menu May through August. Offered at select times during the year, Afternoon Tea in The Café is an opportunity to take in the beauty of Wave Hill House while enjoying a classic selection of whole leaf teas, including green, black and herbal, whole-leaf teas. Afternoon Tea is served with scones, tea sandwiches and bite-sized desserts. Upgrade to high tea for optional sparkling wine along with strawberries and cream. Minimum of two guests are required for tea service. Reservations must be made 48 hours in advance by calling 718.549.3200 x395 or emailing wavehillreservations@greatperformances.com. To inquire about hosting an event at Wave Hill, contact a planner or email celebratefood@greatperformances.com.